Synopsis: An animated adventure for all ages, with an all-star cast and original music, "Smallfoot" turns a myth upside down when a bright young yeti finds something he thought didn't exist"a human. News of this "smallfoot" throws the simple yeti community into an uproar over what else might be out there in the big world beyond their snowy village, in an all new story about friendship, courage and the joy of discovery. There's been a giant myth-understanding. What if something you think doesn't exist, thinks you don't exist? What if the giant yetis of legend are real and the stories we tell about them"with their thick wild hair, booming roars and enormous feet"are like the tall tales they tell about us…but with a twist. To them, we're strangely hairless little beasts with screechy voices and freakishly small feet. And entirely imaginary. That is, until one yeti sees a human with his own eyes and becomes a believer. That's the big idea behind "Smallfoot," a joyful, laugh-out-loud, family-sized adventure set in a dazzling snowbound world above the clouds, that starts when a man named Percy comes face to face"or face-to-knee"with a yeti named Migo. This astonishing encounter sends them both on an unexpected journey of discovery that will open their hearts, challenge old ways of thinking and show them there's more to life than they ever thought possible. "For a storyteller, premise is everything," states director Karey Kirkpatrick, who also shares screenplay credit on the film with Clare Sera. "Turning a myth on its ear and playing around with a traditional point of view is irresistible. We've all heard stories of these mysterious creatures with strange habits. But what about our own strange habits? Let's face it, we're weird creatures in many ways. And it's fun to take a comedic look at that from a different perspective…a yeti perspective." Shocked at first, even frightened, Migo and Percy are soon delighted to have found each other. For Migo, capturing a "smallfoot" will be the greatest and most important thing he's ever done, and he can hardly wait to tell everyone in his village about it. If only he can get his tiny prize home in one piece. For Percy, a down-on-his-luck animal TV show host, evidence of an actual yeti could put him one viral video away from the fame and glory he craves, and he's determined to capitalize on this good fortune. Even if it's the last thing he ever does. Once a pretty good guy, Percy has lately been making some questionable choices. Maybe what he really needs is a walk on the yeti side to reset his priorities. As for Migo, a yeti who now believes in the smallfoot despite everything he's been told, it's time for him to start thinking for himself. "Smallfoot" follows Migo and Percy through a realm rich with imagination, heart, humor and high spirits. Unique characters are brought to life through leading-edge animation that finds warmth in the coldest climates, and a diverse cast from the ranks of film, television, sports and music: Channing Tatum, James Corden, Zendaya, Common, LeBron James, Danny DeVito, Gina Rodriguez, Yara Shahidi, Ely Henry, and Jimmy Tatro. The film also showcases original songs written by brothers Wayne Kirkpatrick and Karey Kirkpatrick, and performed by Tatum, Zendaya and Common, as well as rising young recording artist CYN, along with a deftly rewritten karaoke number delivered by Corden that everyone will recognise. Music superstar Niall Horan also contributes his new song, "Finally Free." Says producer Bonne Radford, "My last four movies were musicals, and I believe that if you have a great scene or a plot point, telling it in song is not only more entertaining and emotionally engaging, it's more efficient in terms of giving audiences a sense of your story and characters. The songs in 'Smallfoot' aren't really Broadway and aren't really pop. They touch on several bases and styles and fall together into a land of their own that's really unique to the movie." Radford, marking her fourth feature with Kirkpatrick, recalls that in the project's early stages, "Karey came aboard as a writer. Then he became the director, and then he became a songwriter, because he has all those talents and that experience. We couldn't be happier that he was the guy to pull all of it together with the creative vision to make this movie come to life." The action, meanwhile, is packed with flights of hilarity inspired by the iconic Looney Tunes shorts. From gravity-busting boulders to freefalls from impossible heights, Kirkpatrick and his colleagues paid homage to these timeless comic tropes throughout the film. "One of my favorite things about this movie is it's such a throwback to those classics," says Channing Tatum, who stars as Migo. "There's a lot of physical comedy. These yetis are just so huge, they're indestructible, yet they're vulnerable in small, funny ways"like, Migo pricks his toe and a tiny bubble of blood comes out and he reacts like he just lost an arm. And there's a goat that screams. He just screams no matter what happens, and he doesn't have any other facial expression; just deadpan and panic. I will laugh at that forever." By honestly addressing the story's emotional stakes, the filmmakers gained leeway to play fast and loose with the physical stakes. Says Kirkpatrick, "Making those tonal choices allowed us to run with it and truly take advantage of what animation can do, and you buy it because you're having such a good time. For our storyboard artists and animators to acknowledge animation pioneers like Chuck Jones and Friz Freleng, believe me, it's like being a pig in slop. How far can we push this? My answer was, 'Go for it, make me tell you you've gone too far,' and I believe those were the times where we came up with the biggest laughs." There are also, he acknowledges, nods to landmark cinema that should delight savvy fans. "Being a film buff, there are tons of images in my head. There's a sequence of Migo running from a plane that's right out of 'North by Northwest' and another that's an homage to one of my favorites, 'Dr. Strangelove.' That's mostly for mom and dad but some of the kids will probably get it, too. Kids are way smarter and savvier than we give them credit for." To that point, younger moviegoers will be quick to embrace one of the story's central themes that celebrates what they're already hard-wired to do: be curious and ask questions. But "Smallfoot" takes it to a new level, as exemplified in the character Meechee: a real searcher and one of the very few yetis who harbors the secret hope that smallfoot might really exist. "'It's not only about asking questions but finding your own answers and discovering the truth for yourself," says Zendaya, who stars as Meechee. "You can't always be satisfied with what's given to you or handed down. Sometimes it's important to step outside of that, and I think what's cool about this movie is that it encourages seeing life through someone else's eyes and having empathy and compassion for someone who may have an entirely different view of things." As the story opens, Meechee's philosophy is summed up neatly with the aspirational song "Wonderful Life," in which Zendaya sings "a life full of wonder is a wonderful life." The problem is, not everyone in the yeti community is on board with that open-minded and open-hearted approach. In fact, they have laws against it that are literally written in stone and curated by Meechee's dad, the Stonekeeper. Played by Common, he is dedicated to maintaining the status quo by suppressing curiosity. It's a philosophy he just as neatly expresses in another song, "Let it Lie." Despite Migo's evidence, Common explains, "He's determined to prove that smallfoot doesn't exist because it's written in the stones. If the village realises that even one stone is wrong, it would break up so much of what they thought they knew. It would shake up their belief in a system that has been working for so long and keeping them safe." Consequently, notes screenwriter Sera, "They've constructed a daily life so busy with rules that there's no opportunity to stop and think. The motto of the entire community is, 'Ignorance is bliss.'" Stonekeeper's aversion to change makes things especially hard for Migo, Meechee and Percy. His counsel will test Migo's courage and commitment in ways he never imagined. The question is, will he ultimately stand in the way of what this young yeti needs to do? Because "Smallfoot," at its core, is an adventure. NBA icon LeBron James, who takes on the role of Migo and Meechee's yeti friend Gwangi, brings it all home with a memory from his childhood. "In my neighborhood, when you heard kids playing outside, that's where you wanted to be. It was the summer air, the camaraderie with your friends, just the joy of being a kid. I always had the idea of 'Let's see what's going on in the next block.' Then that became 'the next community,' 'the next city,' 'the next state,' and now, for me, it's become, 'Let's see what's going on in the rest of the world.' It's important to be open to adventure because there's so much great stuff out there." "Smallfoot" began with the inspiration its filmmakers drew from a concept presented by Sergio Pablos, one of the film's executive producers and a veteran animator himself. Producing partners Glenn Ficarra and John Requa, who also share story credit, explain. "The idea was about a yeti finding and interacting with a human, and that seemed so right for a movie," says Requa. "Then Glenn suggested: what if we flip it on its head, where the yetis were the ones who believed humans were a myth? And that became the genesis of our story." With that, audiences could experience the encounter from both points of view, offering what Requa calls "an opportunity to see that what divides us is often just the unwillingness to see the other side, and not see each other for who we really are." "But the heart of the tale is about these two becoming friends," Ficarra adds. "For all the slapstick comedy and the fun, their friendship remains the emotional through-line of the piece." "The stories we like best are layered," says Kirkpatrick. "Beyond an entertaining series of events, there are ideas lurking beneath, a little more meat on the bone, if you will. In this movie we get into themes about truth and lies, questions and curiosity, and the importance of all of that in terms of our own advancement. It's pretty easy to circle yourself off in your own little tribe and say, 'Yeah, this is our world and that's all there is; there's nothing else,' like the yetis believe nothing exists below the mountain where they live. So, to be involved with a story that's about opening yourself up to life and other people was an exciting prospect. And what better way to do it than with an 18-foot yeti and his friends?" Yeti or not, here they come! "Our yetis are nice," Kirkpatrick wants to be clear. "They have big hearts, big feet, and big personalities." Foremost among these is the story's hero, Migo, a happy-go-lucky young yeti utterly at peace with himself and his little world, when we first meet him, with no greater ambition than to take over the job as village gong-ringer when his dad retires. The filmmakers cast Channing Tatum, about whom Kirkpatrick says, "Channing has a great everyman quality and he gave Migo lots of charm and boyish exuberance. You instantly like Channing when he opens his mouth, which is exactly what we wanted with the character, and he was game for anything. When we told him he'd have to sing a song his first reaction was, 'What?' But then he dove right in and he sounds fantastic. "I think most of us can see ourselves in Migo to some extent," the director continues. "It's just easier to accept what you're told and trot along through life, la de da." But everything changes when the yeti spots a downed plane in the distance and chooses to pursue it. Says Tatum, "The yetis run their lives by a series of laws that have been around forever. One of them states there's no such thing as a smallfoot, so when Migo tries to tell everyone about finding the plane and the smallfoot, he is told that what he experienced is just not possible." Yet...it is. This leads to a life-altering dilemma as poor Migo struggles to reconcile what he knows to be true with what is expected of him: recant his story, deny the smallfoot and get on with his happy life, or face ridicule and banishment. Recanting his story means telling a lie, and Migo would never lie. That leaves him no other option but to try and find the elusive smallfoot and bring it back to the village as proof. What Migo doesn't yet understand is that this won't solve his problem; it will only bring other, bigger problems and questions to the forefront. "Migo was content following the rules and had no complaints," says Tatum. "He wasn't looking to stir up trouble. But he gets pushed out of the nest, in a way, and what he finds is that there's real beauty in discovery and so much to learn. After that, it's impossible to go back." Percy, played by James Corden, is unaware of the fateful meeting soon to occur. He has arrived in the Himalayas ostensibly to film a segment for his once-popular, now-failing nature program. Secretly, though, he plans to fake a yeti sighting in an attempt to boost ratings. The character was a treat for the filmmakers as it allowed them to poke fun at some of humanity's worst qualities and foibles, presenting a man who comes across one of the most amazing findings in history and can only think about how to monetize it. "We live in a world where relevance is often judged by social presence, and it's a trap people can fall into"that to be noticed, to rack up likes and followers somehow connects to your self-worth, until your perception of your public image becomes a slippery slope," Kirkpatrick says. "Percy started out as a man with integrity but got into the fame game and lost his soul." Maybe not lost, exactly. Just misplaced. Allowing that, the director adds, "When you meet Percy he's a cad and he's doing some pretty despicable things, so we had to cast someone who could bring this guy to life in a way that makes him loveable and forgivable somehow, and that was James. He's so charming and self-effacing, and so naturally funny." Corden approached the role with a degree of understanding, saying, "When you don't have a framework of family and friends, you can lose sight of what matters. Percy is completely lacking in self-awareness. He's at such a heightened state of panic, he's willing to roll along with anything." This newly christened smallfoot seizes on his encounter with Migo as the windfall he's been hoping for, but he's rather missing the point. As Clare Sera points out, "He thinks he needs Migo for short-term gain, but he actually needs Migo to turn his life around." Their immediate problem, however, is making sense of each other. The shrieks and babble emanating from Percy sound to Migo's ear like the squeaks of a nervous mouse, while Migo's friendly conversational gambits sound to Percy like the ferocious roars of a wild beast. "When you think about it, people communicate with animals all the time," Corden offers, generously extending the example to include his own offspring. "I have a baby, and when I talk to her she just looks at me like I'm a madman. Somehow, we find a way to communicate and this is no different. Percy meeting the yetis is no different than the first time in history anyone set foot on the soil of another country. Human or animal, you'll find a way." The truth is, even if Percy thinks this yeti might make a snack of him, that's a chance he's willing to take. Having already set RECORD on his phone, he just has to survive long enough to hit SEND. Imagine his delight, then, when Migo takes him home to meet the clan, because the only thing that will garner more attention than a yeti on video is dozens of them! Holding the smallfoot triumphantly aloft, Migo returns to his village where the sight of this anomaly electrifies the population. Their rote tasks abandoned, yetis crowd around in shock, excitement, fear"and, yes, wonder"to catch a glimpse of it. "It's big news, but is it good news?" Kirkpatrick poses one of the story's big questions as events begin to snowball. It certainly looks like good news to Migo's not-so-secret crush, Meechee, who is the most eager to see this specimen. Smart, independent and deeply curious, Meechee has long suspected smallfoots exist and possibly a great many other things she doesn't yet know about. Being the Stonekeeper's daughter prevents her from asking questions, but it hasn't stopped her from thinking of them…or from forming the clandestine organization S.E.S., for Smallfoot Evidentiary Society. There, she and three like-minded companions meet to pore over and absurdly misinterpret their scant "evidence""a broken ski pole, a down jacket and a roll of toilet paper"and dream about this glorious day. "I love Meechee because she's just so different," Zendaya says of her character. "She's the last person you would expect to be involved with anything outside the box because she's supposed to follow in her father's footsteps and uphold the values of the society. But all she does is question things. She doesn't accept that the yeti village floats on a cloud and that there's nothing underneath it. She wants to know how everything works." She certainly wants to know what makes this smallfoot tick, where he comes from, what he does, and if there are others like him. At the same time, Zendaya notes, it's not all scholarly. "Once she gets on a train of thought she just can't stop. There's so much running through her brain, so don't get her started or it's just 'blah blah blah.' It was fun finding the comedy in that and in her occasional awkwardness." Says Kirkpatrick, "Zendaya made Meechee playful, fun and accessible but also brought home those moments that reveal Meechee's strong convictions. We wanted a strong female lead, and Meechee is the most principled character in the story from the beginning. She loves her father and doesn't want to confront him until she has the proof she's been seeking." From Migo's first admission that he saw something strange out on the ice cliffs"before he and Percy even meet"it was Meechee and the S.E.S. that supported his quest. Now they welcome him back with pride and Meechee can finally open that discussion with her dad. Of course, Meechee's thirst for knowledge was not unknown to her father; in fact, it was a growing cause of concern for the venerable Stonekeeper. But he didn't realize the depth of her commitment until this upstart Migo brought a smallfoot to light. Now this puts him between a rock and…well, another rock. "It taps into every parent's fear about their kids," Kirkpatrick offers. "You know they gotta go out and explore the world at some point and you can only protect them so far." Stonekeeper is not a villain in the usual sense, though he does some villainous things like supporting lies and kicking Migo out of the community. But maybe he's doing the wrong things for the right reasons. It's complicated, and Kirkpatrick credits Common with bringing that complexity to bear in his characterization: "His performance brings different dimensions to the role, not only a soulfulness but a sort of smooth, unflappable quality that keeps us from going down that road of the mustache-twirling villain." "We wanted Stonekeeper to have dynamics, so that audiences wouldn't just dismiss him or say, 'This guy's evil,'" Common expands. "Because people are dynamic. You could be doing bad things but still be a good person. Karey and I worked together on the Stonekeeper's voice to get the right balance of darkness and warmth." But what could be so wrong about acknowledging the existence of a smallfoot, especially when there's one staring you right in the face? As Common sees it, "He's not only the father to Meechee but to the whole village. He's a leader, and being a leader is tough. The job of Stonekeeper carries a lot of wisdom and authority. He's determined to prove the smallfoot doesn't exist because the yetis live in a small world and that's OK for them. It's good. Things are perfect and he wants to keep it that way." In fact, Stonekeeper is so intent on suppressing the arrival of the smallfoot and its inevitable fallout that he might just decide the safest option is to make Percy disappear. That possibility certainly wouldn't surprise charter S.E.S. member Gwangi, played by LeBron James. Gwangi never met a conspiracy theory he didn't like. A burly, wild-haired yeti nearly as wide as he is tall, Gwangi is convinced there are secrets everywhere and definitely something fishy going on right under their noses in the village, though he's not sure exactly what that would be. He can also be quite loveable and dependable, and a loyal friend. Just don't call him crazy. Says James, "What I think makes Gwangi such an important member of the group is that, he's larger than life"in more ways than one. He's giving, he's charismatic, he's funny. Also he's big and fluffy and everyone tends to gravitate toward the big and fluffy." He approached the role organically, saying, "Playing funny is something I do on a day-today basis because I have three kids and friends who I've been laughing with and cracking jokes with my whole life. The one thing I've learned in life is to never take yourself too seriously, and if you can't laugh you're going to be in trouble. So once I saw myself as Gwangi, it was pretty easy to lock into that and get into a fun, playful mood." The filmmakers approached James after designing the character and, Kirkpatrick recalls, after "seeing him in 'Trainwreck' and thinking, 'Wow, this guy is really funny.' He has a great matter-of-fact delivery that worked perfectly for Gwangi. It turns out that not only is LeBron James the greatest basketball player in the world, he also happens to be a terrific actor, which is not at all unfair," he adds, tongue in cheek. Another of the S.E.S. group is Kolka, played by Gina Rodriguez. A bit of a science nerd who wears her hair in a casual ponytail, Kolka closely guards the organization's artifacts in the hope of one day adding to the collection with more smallfoot items"or, when she dares to dream, the mythical creature itself. "Gina is so versatile and engaging," says Kirkpatrick. She balanced Kolka's quirky, kooky qualities with a strong sense of purpose that should really connect with audiences." Kolka is devoted to Meechee and the cause and, as Gina Rodriguez hints, "They end up being quite heroic, the S.E.S. We all know these characters: they were the dorky kids in school that later end up being the cool people in life. Kolka is the ultimate believer in what's not in front of us, like crystals and listening to the wind and her own intuition. What's fun about the S.E.S. is that they remind us to be curious and have faith, and to think beyond what's in front of you, which is harder as we get older and lose some of the joy of imagination." Finally, bringing up the rear of the S.E.S. is the diminutive loudmouth Fleem, played by Ely Henry. "He's bizarre, selfish and loud," Henry states. "Fleem cares almost exclusively about himself and he'll do anything to further his own interests. Yet, he's oddly loyal, which is shocking. If you're friends with Fleem, he's going to be there whether you like it or not. There's a Fleem in every group. If you don't think so… it's you. "Karey and I worked to get Fleem to the right level of annoying and then honing and maintaining that," the actor recounts. "If he's too annoying, no one will like him, and if he's too lovable, we can't get away with some of the stuff that happens to him that's meant to be funny." Representing the opposite side of the spectrum, and more typical of the community at large, is Migo's father, the decidedly un-curious Dorgle, played by Danny DeVito. Says Kirkpatrick, "The minute we saw the design for Dorgle and thought of what he'd sound like, I said, 'Danny DeVito would be perfect for this, and I hope he says yes! And we won't take no for an answer.'" "Dorgle doesn't care about smallfoots or anything that might exist beyond the village," DeVito states. "He only cares about two things: being a good father and beating his head against the wall"actually, beating his head against a giant gong, because that's his job. It's an important job and he's proud of it." Every morning, the stalwart yeti catapults himself head-first into an enormous stone gong to awaken the great glowing snail that crawls across the sky to light the village. Though it comes at some personal cost"stunted stature, a flattened head and a perpetual ringing in the ears"it's an honor that has been passed down through generations of Dorgle's flat-headed family and will eventually fall to Migo. But Dorgle may be on to something. DeVito adds, "The one piece of advice he gives his son is this: 'true your aim.' He's talking about hitting the gong but, as the story unfolds, it takes on a greater meaning." Meanwhile, even as Percy's arrival stirs upheaval in the once peaceful yeti landscape, challenging the stones and awakening the population to possibilities previously unimagined, Percy remains focused on one purpose: transmitting his remarkable footage to his show producer, Brenda, to upload online. The role of Brenda happily reunites Yara Shahidi with Karey Kirkpatrick for the first time since he directed her big-screen debut opposite Eddie Murphy in "Imagine That," when she was six years old. "I've been watching her career with pride and admiring the things she's been doing in her life," he says, "and in thinking who Brenda is"a woman who stands for integrity"she was a perfect choice. Honestly, I just wanted to work with her again. She's super-talented." Percy hasn't spoken to Brenda since she walked out on him in disgust, following his plea for her to don a silly yeti costume for the camera. Wherever he went, Brenda feels, a little time alone might do him good, might remind him of who he used to be: a man who wanted people to understand and care about nature and animals as much as he did. "Brenda is Percy's conscience," says Sera. "She's definitely the voice of reason for him," Shahidi concurs. "She got into the zoology business because she believes in learning about the planet and sharing with the world the beauty of its creatures. So, when Percy resorts to trickery to get his viewership up, she's the one saying 'No, we can't do this, we're not going to use a costume to fool people.' In the long run, though, the joke's on her because yetis do exist!" Shahidi continues, "Brenda's perception shifts with her realisation that she doesn't know everything. It's really parallel to Migo's and the yetis' journey because they've been told certain truths and that nothing exists outside of these truths, so for Brenda, too, there comes a moment when she realizes there's something in this world she was unaware of." Completing the main "Smallfoot" cast is Jimmy Tatro as the hapless Thorp. Both Tatro and Ely Henry were what is known as "scratch" actors, hired early in the animation process as the characters and story were still being developed. Neither expected to remain with the project to its completion, as that's the nature of the job. But, Kirkpatrick says, "Ely and Jimmy have such great, unique voices and are both so funny and collaborative. They gave us so much excellent material that we all said, 'We can't replace these guys; they own these characters.'" Thorp, despite being Stonekeeper's son and Meechee's brother, has neither his old man's gravitas or his sister's agile mind. A born rule-follower, he lives to serve the stones and win his father's approval and would swear that up is down and that the smallfoot is a hairless yak if dad said so. Largely harmless, and clueless, he nevertheless has a knack for turning up where he's least expected"like the middle of an S.E.S. operation"so Meechee and her friends try to keep out of his way. "There's a lot of insecurity in Thorp's personality, probably because his dad is the ultimate alpha and there's a lot of pressure to live up to that," Tatro observes. "I think Thorp knows he'll never get there, but still he tries to assert some second-hand authority in the village, which is laughable because no one really pays any attention." Also joining the fun in impactful cameos are Patricia Heaton, as a grouchy Mama Bear who doesn't appreciate Migo and Percy blundering into her cave just after she's put junior to bed, and Justin Roiland, as the excitable yeti Garry, whose over-the-top reactions to everything can really spook a crowd. The filmmakers couldn't be more pleased with the range and caliber of talent assembled for "Smallfoot," as well as the passion and personality each brought to the mix. "We have such a fantastic, multi-talented, diverse cast, and what they bring to their individual roles not only makes those characters pop but elevates everything. They enabled us to write to them as opposed to just having them perform what was written," says Ficarra. "As a director on an animated feature, you approach casting almost like you're creating an orchestra," says Kirkpatrick. "You need different voices, different textures, different sounds. You don't just want a bunch of violins." Requa concurs, adding, "You hope your cast brings so much to the table that your initial draft is more like a first pass on what the characters will be. Once you start recording, the real character begins to emerge and that inspires the board artists and writers." Most of the "Smallfoot" dialogue was recorded in standard fashion, as individual sessions booked over the course of months while characters evolved and schedules allowed. Still, the filmmakers sought to pair their cast when possible, and there were some tandem dates. Channing and Zendaya got together on one of their key scenes, as did Gina Rodriguez and Ely Henry. Henry even flew to Cleveland to record with LeBron James, who was too busy tearing up the basketball court at the time to travel to Los Angeles. "LeBron wanted to come in but he just kept winning. It was annoying," Kirkpatrick deadpans. Instead, the director planned to fly to Cleveland to take in a game and then record with him but was detained by his own production schedule, so Henry stepped in, as the scene was between his and James's characters. "Upon his arrival, he was met with VIP tickets," Kirkpatrick continues, "which was somewhat of a conflict for him as the Cavaliers were playing the Toronto Raptors and he's from Toronto. So, there he was, a guest of the Cavaliers and getting the VIP treatment and just hoping no one back home saw him." More often, actors loosened up in the booth with Kirkpatrick and occasionally Clare Sera, who met years ago in an improv group and enjoyed the chance to flex their acting muscles. For Kirkpatrick, it's a matter of trust"more so in this medium than in others. "For actors who haven't done a lot of animation it's an odd process to step into," he acknowledges. "Acting is an incredibly vulnerable thing to do; you have to put yourself out there, make bold choices and trust that the director will pick your best. It's a little easier in live action, where you're working with another actor, in costume on a set. With animation it's a recording studio. There's a music stand with a script, a microphone and maybe some storyboards. So that trust exercise is times 10." Says Rodriguez, "I've done animation for a few years and working with Karey is really next-level. He's right there in the booth with you. He's playing the other characters, giving you perspective, throwing you ideas; he just lets you bounce off the wall. What's beautiful about animation," she goes on to say, "apart from expanding your imagination, is that it's a space where things like skin color and gender don't matter. You just get to be a storyteller, and that's nice." As Common describes the experience, "Karey brings out the kid inside you. He's creative and collaborative and has a real appreciation for music and film, and he uses that knowledge to activate your best possible performance." Two of the most notoriously difficult elements to animate are fur or hair, and water in all its forms, including ice and snow, and "Smallfoot" is rife with all of these. Kirkpatrick concedes, "There's no way you can tell a story about yetis in the Himalayas without hair and snow and ice. Migo alone has more than 3 million individual strands of hair and lives in a world of rocks, snow and ice." Migo's final hair count was 3.2 million strands, while his outsized comrades clocked in at 2.5 million for Meechee and Fleem, 5 million for Kolka, 1.3 million for the robed Stonekeeper and a whopping 9 million for the super-sized Gwangi. In a field that's constantly refining and innovating to meet creative demands, "Smallfoot" inspired animators to push the boundaries even further. "There was a lot of R&D," Kirkpatrick continues. "Just to get the hair looking real and moving would have taken 200 hours for one frame, so we had to find a way to get that time down. We had three densities of snow because every time a yeti walks through snow it leaves footprints. Things get kicked up, and that's FX." Throughout production, Kirkpatrick worked closely with key members of the creative team, most notably visual effects supervisor Karl Edward Herbst of Sony Pictures Imageworks and the company's senior producer, Skye Lyons, who has an associate producer credit on the film. He also reunited with co-director Jason Reisig, with whom he'd previously worked on "Over the Hedge" and whom he calls "one of the top animators in the world," to collaborate on the technical and artistic aspects downstream while he focused more on the story and performances. The "Smallfoot" yetis had to convey warmth and humor without compromising their impressive proportions, all of which figured into their design. Bonne Radford says, "We steered away from what would look like an ape or a bear, what traditionally we thought people might imagine a bigfoot or a yeti to resemble. We gave them long legs, which gave them the ability to leap. That also released us from the laws of physics and we used that to our advantage for physical comedy. Overall, the yeti character designs are really loveable. They look soft and inviting. You just want to hug them." The yetis' body structure was based on ovals, from their torsos to their eyes, with pearshaped faces the filmmakers found most appealing. Herbst and Lyons developed an entirely new software system for the eyes, which Lyons vividly describes: "It allowed us to squash, smear and stretch the head and eyes as much as we wanted while the iris and pupil shape remained exactly the same." Similarly, they created a hair-shading system specifically for animal, rather than human hair, that allowed them to change from strand clumps to individual strands, enabling much higher fidelity in detail and qualities like texture and softness. This was particularly useful to keep hair simulations from breaking up amidst the film's style of heightened action and the various degrees of wind velocity that might blow back a yeti's coiffure"such as when he's barrel-rolling down a mountain or sailing off a cliff. To offer an idea of the detail involved, Reisig outlines, "After the character animation was done, we ran simulations on each of them to capture the natural dynamics of a piece of hair, fur or cloth. Meechee, for example, was our most complex character. She has long flowing hair that creates a kind of dress, and another layer on top that looks like a shawl, and a braid on top of that. All these elements overlap and interact with each other so, whenever there was a change to the character, those situations had to be run again." Making the mostly white-haired yetis pop against their environment of snow and ice was another factor, largely accomplished with lighting. Lyons explains, "We would either enhance the snow color, for example, make it more golden, or enhance the character's color with a rim light to create more of a visual break between them and the snow. Generally, we kept the snow a shade darker, so the yetis would be the brightest objects in the scene." Lighting was also used throughout to give the film a "shot" versus "rendered" look. The yetis live in a beautiful natural landscape where blue sky meets the mountaintops and there is nothing to see below but billowing clouds. Everything is clean, cool and visually inviting" a veritable frozen paradise and made-to-order playground for the "Smallfoot" action. For the animators, all that snow was a formidable challenge"whether falling, lying on the ground, or being kicked up by active feet"which led to more innovation from Lyons' team, namely the Katyusha. Named after a World War II rocket launcher used on the Eastern front, the proprietary Katyusha software proved a more efficient way of getting high resolution of granular snow. "The idea is divide and conquer," says Lyons. "Shoot a lot of small rockets"or in this case, snow"at one time instead of one big one." Also making its debut on "Smallfoot" was a snow-padding system whereby the animators employed tools to automatically and seamlessly drop large swaths of snow down into any environment, based on programmed variables like wind direction, amount of snowfall and relative "stickiness" of the objects to be coated. Other key visual effects involved the handling of steam and clouds, fire and fireworks, and Stonekeeper's robe of stones, which was particularly complex as it represented two independent but interconnected layers on top of the character. 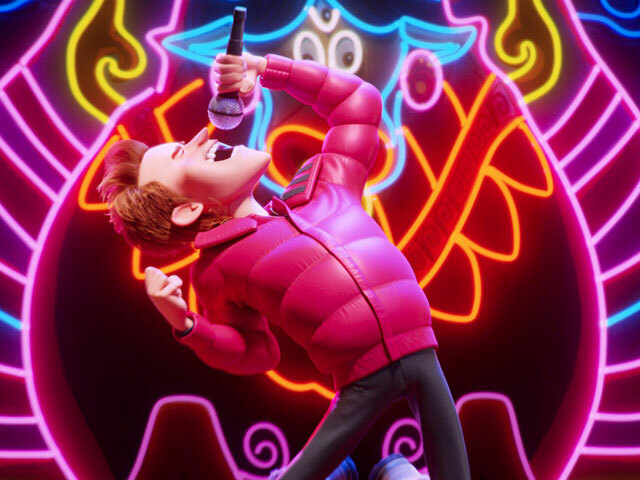 "The Only Thing Stronger than Fear is Curiosity"
"Smallfoot" features Niall Horan's new song "Finally Free," which became the first single from the film's soundtrack. Playing over the final credits sequence, "it touches on the themes of the story first introduced and so creates a perfect bookend and a great way to end the movie," Kirkpatrick says. The director and his brother, Wayne Kirkpatrick, recently collaborated on the hit Broadway musical comedy "Something Rotten!," which earned Tony, Drama Desk and Outer Critics Circle nominations in 2015, including Best Original Score, as well as a Grammy nomination for Best Musical Theater Album. Together, they brought their songwriting verve to "Smallfoot" with five original compositions. The film's buoyant opening number, "Perfection," performed by Channing Tatum, introduces audiences to Migo and his life with a sly wink to the audience, as it becomes clear that what he's saying doesn't exactly match the facts. "Instead of a lot of exposition," notes Requa, "there's this guy walking through his village, singing about how you should push all your questions deep down inside and how that's completely perfect, and you're thinking, 'Wait, that's messed up!' And boom, the audience gets it immediately and it's funny." For Kirkpatrick, "The general rule is to ask, why are they singing? And the answer would have to be because the scene gets you to a point where the best thing to do next is sing it. It elevates the emotion, it elevates the comedy, it allows you to go into a surreal and otherworldly place and takes you to new heights." "Wonderful Life," performed by Zendaya and "Wonderful Questions," performed by Zendaya and Tatum together, represent another perspective by making the point in an uplifting, powerful way that it's curiosity and new ideas that make life worth living. Things then take another tonal shift with the double-entendre "Let it Lie," performed by Common as a rap, in which Stonekeeper takes Migo into his confidence and reveals some ominous truths about the history of their community. The movie also includes a karaoke version of the '80s hit from Queen and David Bowie, "Under Pressure," performed by James Corden with lyrics cleverly revised to help Percy try and persuade his producer to see things his way. Finally, the Kirkpatricks' "Moment of Truth," performed by pop singer CYN, sums it all up in a rousing, upbeat finale. "Music is insanely important to this story because of how it reveals plot and character in a powerful way. There's a lot of world-building that needs to happen," says Glenn Ficarra. Throughout, the Kirkpatricks worked closely with "Smallfoot" composer Heitor Pereira, a multi-talent who preceded his successful scoring career as a member of the band Simply Red. The process was synergistic, with Pereira influencing the songs and the Kirkpatricks influencing the score. "Cues for Meechee's theme became part of 'Wonderful Life,' Migo's theme became part of 'Perfection' and Stonekeeper's theme became part of 'Let it Lie,'" Kirkpatrick says. "Wayne would come to Heitor's studio while we were working on our songs, and they'd go through the demo together. Approaching it as a composer, with the orchestration, he kept urging us to go bigger. He elevated everything." "For movies like this, animated family movies, the music really reveals the souls of the characters," Pereira responds. "It's a beautiful thing to work with musicians that understand the power of melody and appreciate it when you bring your own in and create this tapestry of counterpoints. There is a narrative for each character that is a story inside the story, and the melody you start with will not be the only version of it. It will need to be happy and comedic, it will need to be sad, it will need to be hopeful." Most of all, it's fun. "I hope audiences enjoy this glimpse into a fun and lively world like none other," Kirkpatrick concludes. "It's such a charming story. We had an incredible cast and an amazing team pushing the boundaries of digital animation to assemble this movie, and I believe people are going to fall in love with these endearing characters as much as we have."